Our Stewardship Plan is our core management plan for Ennerdale which has guided and directed us since 2006. The Stewardship Plan is our core partnership document which helps steer and influence decisions. It represents the day-to-day work and longer term aspirations of the four partners to help deliver a cohesive and effective approach. The plan covers the combined partnership owned land of 4,400 ha (10,872 acres). 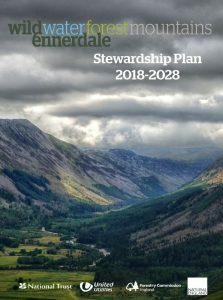 The first Stewardship Plan was completed in 2006 to document and share our thinking and practical approaches to enable a more natural process led approach in Ennerdale. 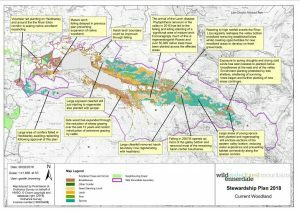 It replaced the first Forestry Commission Ennerdale Forest Design Plan from 1996 and saw an important shift from management focused on separate land ownership to a holistic landscape scale plan representing all three major landowners. It has been widely distributed and available on our website over the last decade. During 2018 we reviewed, updated and widely consulted a new Stewardship Plan which aims to continue to engage, provide a steer and insight into our plans for the next decade. Our Stewardship Plan is not a typical management plan with prescriptive targets and deadlines. There is no endpoint. As the emphasis is on moving away from ‘management’ in the traditional, controlling sense, it aims to demonstrate the broader concepts for change and ‘direction of travel’ in Ennerdale. Broad levels of detail are provided by themed maps , though any such information should be viewed as indicative of what could happen, not what will, as nature is unpredictable, and our approach is opportunistic as we continue to learn. 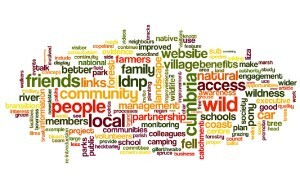 Our Liaison Group is made up of Cumbrian organisations who have an interest in the Ennerdale Valley. The group last met in March 2018 when we shared an early copy of our new Stewardship Plan and our ideas for the Valley Head planting project. The group met previously in June 2011 at the Ennerdale Scout Centre and spent the morning providing feedback on the Partnerships achievements and where our priorities should be over the next 5 years. The afternoon was spent outside with a field visit to Heckbarley to discuss the future of this area after all the conifer has been cleared. To try and tease out the key points and issues the replies to each question have been converted into a word cloud. The clouds give greater prominence to words that appear more frequently in the source text by making those words larger and differently coloured. You can also read the full report. Our current Stewardship plan is available in sections to download below. Our first Stewardship Plan is available as an archive and for comparison to future plans. The text contains an introduction which helps explain the Stewardship Plan approach.